Our Models of VTALK headsets are one of the most Durable, Sturdiest & Reliable headsets in the world, with a life span & repairable up to 5 years. 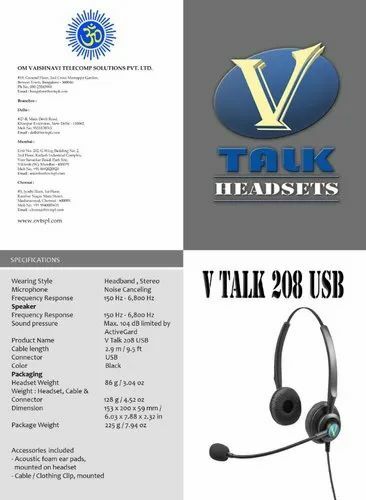 Regarding our product line we assure you that all products offered by us are time tested, durable, reliable and absolute value for money as compared to other brands.The one time use of VTALK quality headsets and service will keep you satisfied. "Om Vaishnavi Telecomp Solution Private Limited" is a private limited organization which started its business in the year 2013 and deal in Sennheiser Product. Earlier Company Named OM Enterprises. The firm is located at Benson Town, Bengaluru, Karnataka and operates its entire business activities from there. We distribute and supply huge number of Wireless and Call Center Headsets such as High Definition Headsets, Wireless Headsets, USB Headsets, Computer Headsets and many more. We share excellent business relations with a huge vendor base which guarantees us world class quality products to help us to run our entire business operations in a very smooth manner. The products offered by us guarantee excellent quality as they are manufactured by top brands Sennheiser that have great name in the whole Telecom industry. The offered headsets ensure best sound clarity without any disturbance. The entire range brings peace of mind to end customer as they are easy to install and operate. Moreover, owing to negligible maintenance they qualify to be the first choice of the entire clientele.